Nybbles from Albert: Horsley Park Half-Lunch and Civic Centre Half-Salute! Horsley Park Half-Lunch and Civic Centre Half-Salute! It's a day of halves today. I was supposed to have lunch at a friend's house at Horsley Park around noon. Had a badminton session at Homebush from 11am till 12 noon, so by the time I left the house it's already 12. The TomTom application on my E65 tells me Horsley Park is only half an hour away. It probably didn't factor in normal road traffic because I got there 45 minutes late. From Horsley Park, it's another half-hour to Chatswood where I'm supposed to attend a farewell concert by the Willoughby Symphony Orchestra and Choir starting at 2pm. Again, the TomTom didn't factor in the fact that I left the concert ticket at home, so I had to abort a nice vegetarian lunch, drive all the way home, then drive (quite fast) to Chatswood. The concert, entitled Civic Centre Salute, promises to be a grand one. After 35 years of being home to the Willoughby Symphony, Willoughby Civic Centre is transforming into the Chatswood Civic Place, and this is going to be the orchestra's last concert in this venue. By the time I got to the Civic Centre, people were just coming out for the intermission. That's half of the concert gone already. Apparently, I have missed Rossini's La Gazza Ladra Overture, Beethoven's Symphony No. 5, and a few others. The rest of the concert is worth all the hassle though. The second set opened with Handel's Hallelujah Chorus. Then we had the Willoughby March. The host gave us this bit of trivia about the piece: it was composed in 1969 by Albert Keats, the first Musical Director of the Willoughby Municipal Symphony Orchestra, and first performed on-site by the orchestra on Feb. 28, 1972. Next we had Mozart's Requiem and Tchaikovsky's third movement from Symphony No. 6. The highlight for me was when the choir sang the O Fortuna chorus from Carl Orff's Carmina Burana. Chief conductor Nicholas Milton borrowed a violin and started playing the opening bars of Hungarian Rhapsody No. 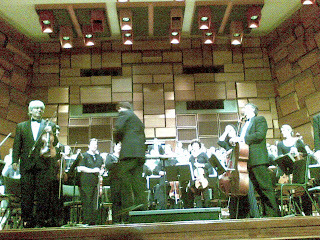 5 (very slowly), then the whole orchestra joined in - playing fast then slow depending on the conductor's whim. We also had Verdi's Anvil Chorus from Il Trovatore, and a few others. For the finale, the orchestra played Strauss Sr.'s Radetzky March, and everyone started clapping along. Reminded me so much of the Vienna New Year concerts that I used to watch on TV. I was sitting along the second row, so the music's really loud and you can see clearly how the music is being created. Very nice.